You are warmly invited to attend the next monthly Vigil for Peace in Norwich City centre. outside St. Peter Mancroft Church (in front of the Norwich Forum building). Please bring peace banners and petitions for peace. 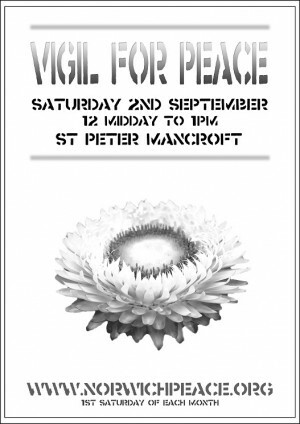 The monthly peace vigils are organised by www.norwichpeace.org with the full co-operation of the St. Peter Mancroft Church, Norfolk Constabulary and Norwich City Council.